More and more companies are finding that a traveling network is a cost-effective network. Allowing employees the ability to work from home or on the road increases productivity and reduces time lost due to absences. VPN enables secure encrypted connections between authorized offsite computers and office networks, allowing companies to maintain flexible, secure workforces. Ingate VPN provides this secure connection and the SIP-capability that enables workers away from the office to utilize highly efficient methods of communication with clients and colleagues. Ingate VPN can also establish secure communications through the Internet between two local networks without the need for – or expense of – buying dedicated external connections, which allows for the existence of remote offices. Ingate VPN uses IPSec, 3DES or AES encryption ensuring maximum security and can communicate with any VPN clients, firewalls and other products supporting IPSec and IKE protocols. Ingate VPN is included in all Ingate Firewalls and SIParators. Ingate products also supports PPTP. Based on IETF standards for the IPSec and IKE protocols. Uses strong encryption, up to 256 bits. Ingate VPN works transparently for the user applications behind the firewall. Automatic regeneration of traffic keys. 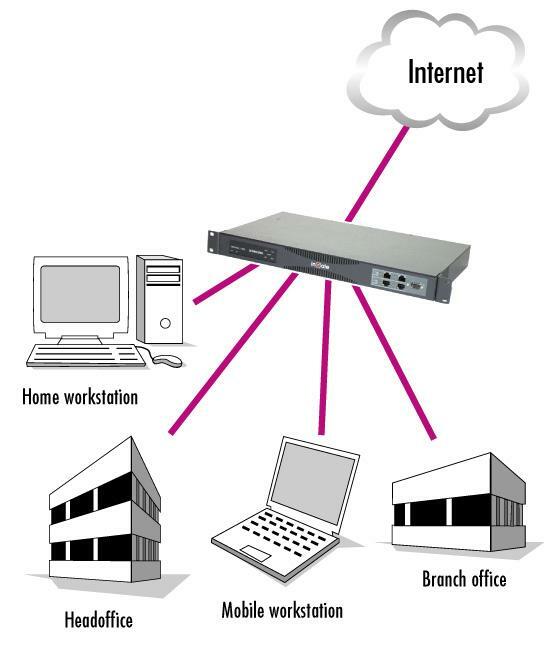 The Ingate VPN module is a software module, included in the Ingate Firewall and SIParator. For detailed instructions on the configuration of Ingate VPN with VPN client, please refer to the VPN chapter in the User Manual. For additional information on Ingate VPN, please contact info@ingate.com.